The panoramic beauty of Himalayan Mountains becomes all the more blissful if you see them through the eyes of your heart, because only then you shall be able to relate this landscape with the divinity it is associated with. 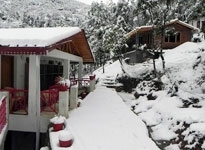 Amidst the vast ranges of the Himalayas, Mukteshwar is an idyllic Hill Station located at 2, 286 meters above the sea level in Kumaon Subdivision. Enshrining Lord Shiva, the Mukteshwar Temple situated at an altitude of 2, 315 meters, is one of the numerous rock cult temples of India. The principal deity being Lord Shiva, a Shiva-Lingam is placed in the centre of the temple surrounded by other deities like Brahma, Vishnu, Ganesh, Parvati, Hanuman and Nandi. Said to bring a fresh shower of rain to barren women, this temple is most visited by the womenfolk. Every year, numerous tourists visit this temple and pay homage to Lord Shiva, asking for blessings. It is also said that pouring water over the Shiva Lingam gives relief from the pangs and pains of life. 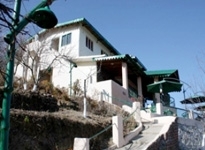 Numerous Hotels in Mukteshwar offer comfortable accommodation for the pilgrims, without exceeding their budgets. 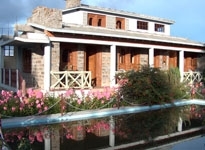 These Hotels in Mukteshwar have sprung up due to plentiful tourist visits to Mukteshwar. 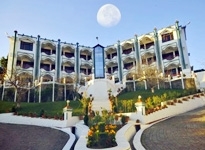 One such is the Krishna Orchard Resort in Mukteshwar. 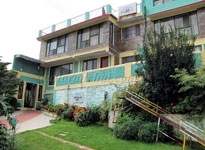 The main facilities offered by these hotels can roughly be categorized into authentic accommodation amidst a cheerful ambiance, Indian and Continental culinary delights and also some of the common hotel facilities like car parking, televisions and in house laundry. One can witness the Chauli Jali adjacent to the temple in Mukteshwar, consisting of natural trellis patterns over rocks, which is believed to bring a child to the sterile womb of a woman. The year 1898 is very important in the history of this place due to the construction of Indian Veterinary Research Institute here, dealing with Bacteriology, Genetics, Productivity and Nutrition of Animals. Devote some of the precious moments of your life amidst for a hallowed experience at the Mukteshwar Temple, while your stay at one of the many Hotels in Mukteshwar.